Subtitled “Perfect gems of city writing”, this book is in the city-pick series (originally known as city-lit). It is an anthology of writing about the most famous capital city in the world with contributions from Virginia Woolf to Peter Ackroyd and all points in between. The book is helpfully divided into ten sections with different themes. City-lit are a brilliant idea thought up by former teacher Heather Reyes who edits most of the series. Other titles include Paris; Venice; Berlin; Amsterdam; Venice and New York. Collect them and read them before, during and after your holiday! This is the only book that I always carry with me when I travel on trains in Britain. The book does what it says in the title. 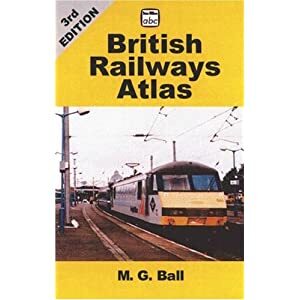 It is a pocket guide to the railways of Great Britain and Ireland with clear black and white maps of the rail network. Ball manages to keep each map admirably uncluttered and, in major centres, has enlarged sections. Inevitably some of the tram details will be out of date, but on long journeys and, particularly unfamiliar ones, the book is invaluable for simply showing where you are going and which station follows which! At the end of the book is a full, alphabetical gazetteer of stations. Josie Dew is a seriously dedicated cycle traveller who has written books about her journeys in America and Japan. This is the first one of hers that I have read and, unusually for a cyclist, the book is set nearly all the time on a container ship. The Russian ship sails from Dunkirk in Northern France to New Zealand via the Panama Canal. Josie is one of only half a dozen passengers, all of whom she continually gossips about! I hope that she has changed their names because none of them would be ones you would like to meet, let alone be stuck for weeks on end with in the middle of an ocean. The writer conveys very well the sheer slowness of the ship’s voyage, not helped by engine trouble. When the ship stops at Tahiti and Josie can ride her bicycle for a few hours, the reader feels as relieved as the writer. I am definitely going to seek out her other books now.